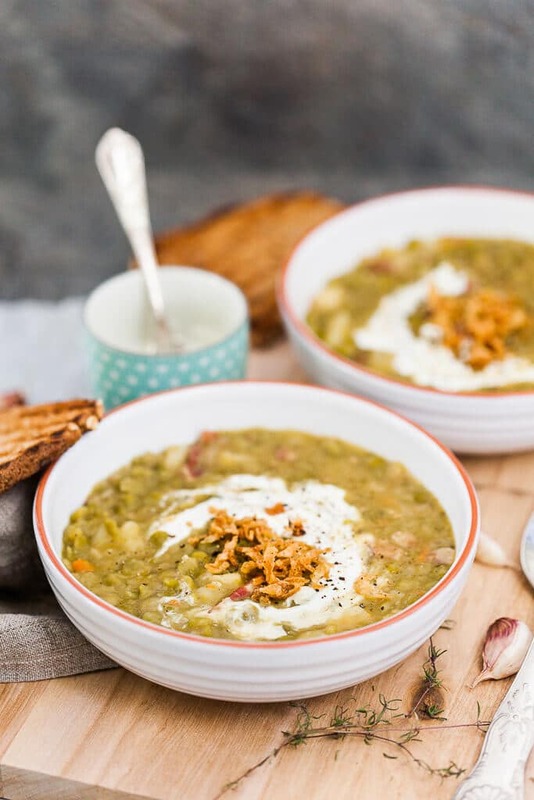 Our love for soup is apparent on our blog. 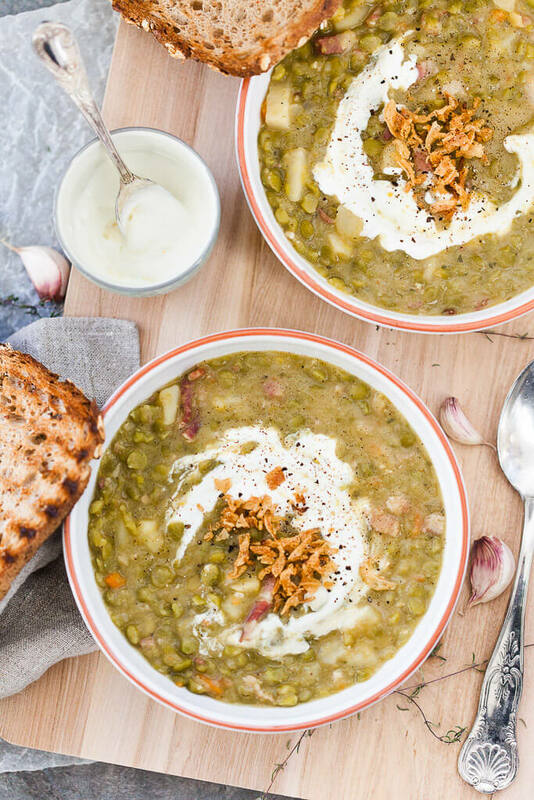 We LOVE a bowl of hot soup, especially in winter months. Soups, stews, minestrones… all good! And on a cold day, we feel it is especially beneficial. And we have had a lot, I mean a lot of really cold days this winter. Luckily by now, it has warmed up and the days are sunny and beautiful. But it’s still February and I guess that means winter is not over yet. Although I like snow and winter, I generally connect it with skiing holidays in the mountains, not a day-by-day reality. It’s been a few years now since I moved to a colder region, but in my heart, I am still a summer child, caressed by the sunshine and surrounded by soft peaches, dark red cherries, and juicy watermelons. And if you’d like to make it vegetarian, just skip the bacon. I guarantee this minestrone will be just as delightful and delicious. 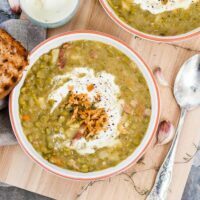 This Split Pea Minestrone Soup is a rustic winter comfort food that will warm you up on a cold day. Skip bacon for a vegetarian option! Start by prepping vegetables. Peel onion, garlic cloves, carrots and potatoes. Finely dice onion and garlic cloves, slice carrot and chop potatoes into smaller cubes. Pre-wash split peas. In a pot, add a tablespoon of olive oil and heat to medium. Add onions and gently fry, stirring regularly, until translucent. Add garlic and carrot, stir-fry for a minute. If you're using bacon, add to the pot and fry until crisp. Then, add split peas and potatoes, and cover with vegetable stock. Bring to a boil, then cook on low for about 25-30 minutes, until the vegetables soften. Taste the soup and season with salt and pepper as needed. Remove from stove. With a stick blender, blend the soup roughly, just a couple of pulses, so as still have bits and pieces of vegetables. If the soup is too thick, add some water as needed to reduce it. 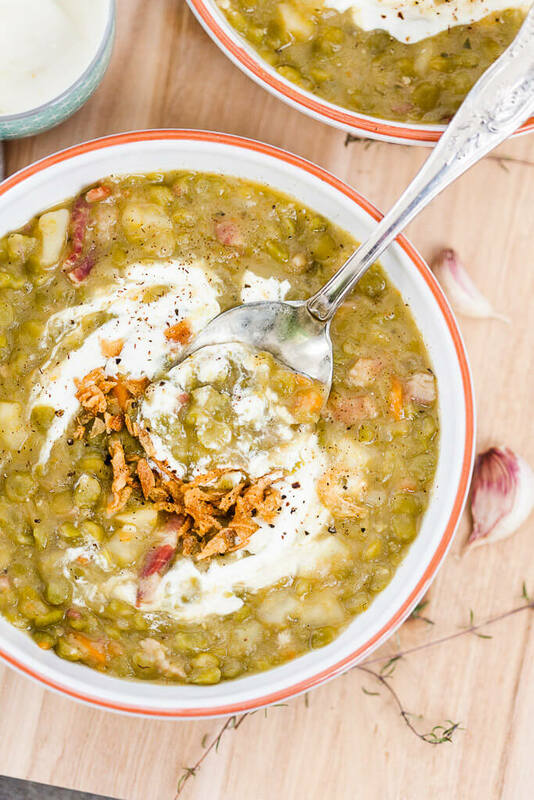 Serve hot in bowls, add a teaspoon of sour cream to each bowl and top with crispy fried onions.